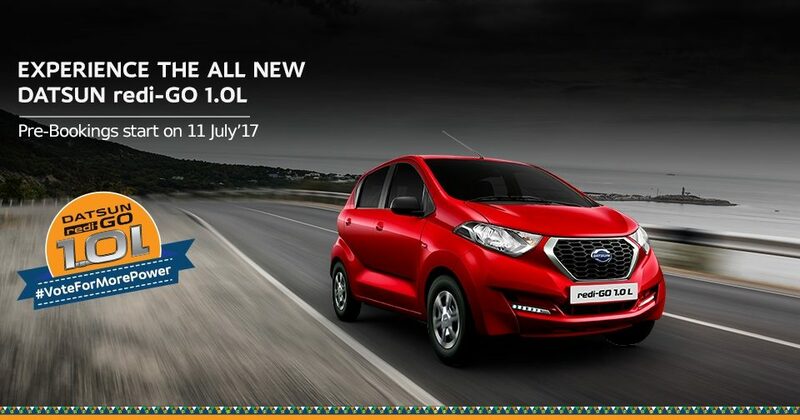 Datsun India today announced the start of pre-launch bookings for the highly-anticipated Datsun redi-GO 1.0L from July 11. Customers can pre-book their Datsun redi-GO 1.0L with a fully refundable down payment of INR 10,000 at Nissan and Datsun dealerships. Deliveries of the vehicles to new owners will commence from July 26, 2017. Launched in India in June 2016, the redi-GO is a versatile car that combines the roominess, agility and efficiency of an urban hatchback with best-in-class ground clearance (185mm) and high seating position. Living up to its name, the Datsun redi-GO 1.0L brings together its best-in-class features with more power coming from the new engine. Nissan Motor Co., Ltd. announced the return of the Datsun brand, Nissan's third global brand, alongside Nissan and Infiniti, in March 2012. Datsun provides sustainable motoring experience to optimistic up-and coming customers in high-growth markets. Datsun represents 80 years of accumulated Japanese car making expertise and is an important part of Nissan's DNA. Datsun started sales in India, Indonesia, Russia and South Africa from 2014. For more information, visit www.datsun.com.